Adam Eichen, co-author with Frances Moore Lappe of Daring Democracy: Igniting Power, Meaning, and Connection for the America We Want, will be joining MarchOnHarrisburg for a speaking tour and democracy training hosted by Unitarian Universalist Churches across Pennsylvania. 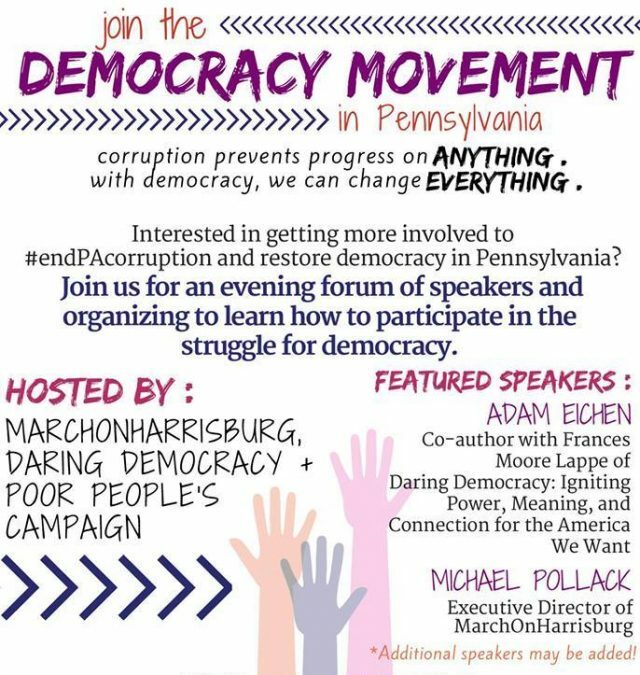 The forum will include presentations from Eichen, MarchOnHarrisburg Executive Director Rabbi Michael Pollack, and other MarchOnHarrisburg organizers. Additional organizers from the Poor People’s Campaign: A National Call for Moral Revival may be added. MOH has signed onto Rev. William Barber’s Poor People’s Campaign, a 6-week national campaign that will engage in nonviolent civil disobedience simultaneously at 25 State Capitol buildings across the country, intending to launch a “moral revival” in our national political debate. After the speakers, there will be a citizen lobbying training on anti-corruption, pro-democracy bills, as well as information about how to participate in the Poor People’s Campaign. Sunday, March 11, 1:00 – 4:00 p.m. at First Unitarian Universalist Church in Indiana, PA.